Urban homestead urban homestead urban homestead urban homestead urban homestead urban homestead urban homestead. What the heck am I doing, you may ask? I'm trying to get a "cease and desist" letter, that's what. I just stumbled across a controversy I had no idea was brewing. 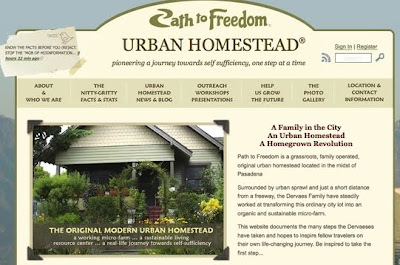 It seems an urban homesteading family actually trademarked the term "urban homestead," and they're in the process of sending cease and desist letters to any and all writers, bloggers, and libraries who dare to use the term. Path to Freedom, Urban Homestead, Urban Homesteading, Grow the Future, Homegrown Revolution (and trowel/fist logo) are registered ® trademarks of Dervaes Institute, notes their website. I found this hilarious to the point of absurd. Trademark terms and then harass anyone using them? Puh-lease. I agree with you! I'm posting on my blog today about this. Keep it up! Ohhh, I've heard of those people. That guy used to drive a freaky van with signs all over it around Pasadena and park outside businesses and "protest." He's a freak. I should say, I have personal experience with these people. It was more than just "hearing of them." He's a religious nutcase among other kinds of nutcase. If anyone had to trademark "urban homestead" why couldn't it have been a NORMAL person?? Oh yes, they have created their own church now "The Church of the Urban Homestead". No, I am NOT joking. It's hard to find the pages for it online now, as since the controversy started they have taken most of them down. From what I HAVE read, it seems to be a cross between fundamentalism, strong *Revelationist* type stuff, Christian Science and a dash here and there of Scientology and the guys own opinions that God speaks through him and his family. Soooo..yeah...not someone I would take seriously. However, Facebook HAS taken him seriously and loads of people there, and on youtube, bloggers, etc have had their pages removed because of the *cease and desist* letters. They have a Tweet on their page that they are not suing bloggers who use those terms, but I think it's more Urban and less Homestead to trademark general terminology and definitely not inspirational to others. just posted it in my blog also. it's fun to see my list of blogs I read posting a protest about this issue! It's a state of the country that needs to be changed. WE can change it by NOT supporting people and places that do things we believe are just wrong! I seriously doubt they can get away with a TM on common language. I strongly suspect that this is a 'self generated' TM and not legally registered. In any case, it's unlikely to hold up in a court of law. Frivolous comes to mind. For the record - I receive posts from both your blog and the Path to Freedom blog through my RSS feed - and they currently have a post up that says this is a hoax, and that those who have received. these supposed letters are receiving them fromfrom someone else. Ymay not agree with all of their views, but you can't deny that they have done some amazing things with their small plot of land. Let's not go around labeling as freaks, eh? Oops, thanks for point that out, Maria. I've incorporated the correct hyperlink. Hannah, I call him a freak based on his stupid van protest. I have that right, I have personal experience. And yes, they are saying it's not a C and D letter, but they do post in their very own website what they DID send out, and it's still claiming ownership of this concept. Stupid. False. One more (does she EVER shut up??) comment: This reminds me of when some lady trademarked "shabby chic" and shut all kinds of designers and little people down. She got away with it, too. The only recourse was to fight it in court, and those who tried, mostly won, but it was expensive, and it did not stop her from continuing to harass others. Wonder if those folks know about the DVs? I subscribe to your blog on my phone reader and keep up with your writing regularly. I am surprised to find you on this side of the fence this time. This issue is about copyright/trademark infringement. As a fellow writer, you should understand that well. When we work hard to communicate our ideas and thoughts, the expression of the same is protected as our property. Copyright and trademark laws are essential to what we do. The Dervaes family had to prove what they were doing was unique and that their business needed protection. Trademarking is not a simple, cheap, or quick procedure. And "Urban Homestead" is not the only name trademarked. "Pioneer Woman" "Real Simple" "Slow Food" "Apple" and many other common words are also trademark symbols. This controversy is a blown-out-of-proportion response from ignorance. The Dervaes family is not sending "Cease and Desist" letters to bloggers. They are not harassing regular families living the homestead dream. However, they have politely asked those who have stolen their work to stop doing so. In response, mean-spirited people have declared it their mission to destroy one family. If someone scrapped your blog and used the "Rural Revolution" name to publish parts or whole of your work and profit from it, you would ask them to stop. And you would be entirely right. WhateverstateIam, I earnestly hope you are correct in that the cease-and-desist letters are not true. I love love love the idea of urban homesteading, so it grieved me to think someone was doing this. I used to work in an attorney's office where a bank's copyrighted logo was being blatantly used by a new business. The attorneys sent a cease-and-desist letter for the logo. I feel that case was a legitimate one. But trademarking a common phrase seems troublesome. Let me rephrase that: Not the trademarking itself, but the idea of sending cease-and-desist letters to anyone using their trademarked terms. The link you provided confirms that these folks are not suing bloggers. That's a relief. However it says nothing about not sending out cease-and-desist letters. Either way, I thought it was an interesting controversy. If these folks are truly being harassed, I tender my apologies. But if they are harassing others for using the term Urban Homesteading - which has been around awhile - then I'll reserve judgment. is a group that has already formed. Those people that have had their facebook pages taken down are NOT using the Dervaes' words, images or material. They are simply using the phrase *Urban Homestead* and are being targeted for that! It reminds me of when "Just Ohio" (aka The University of Ohio) tried to trademark the name/word 'Ohio.' They said they should be known as just Ohio. And in trying to get the trademark, they were going to force The Ohio State University to change the name of their football stadium, Ohio Stadium, to something else. It didn't seem to matter to them that the stadium's been around since 1922. So I agree with Patrice's point of view. What I'm getting from all this is, they sent letters that did not use the exact phrase "cease and desist," so they can truthfully say "We did not send any cease and desist letters! Everyone is being mean and unfair!" But they also admit that they sent out letters stating they have trademarked those phrases and that nobody should use them without a trademark symbol. I believe they have plenty else to be doing around that farm than dealing with this, and if they were smart, they would get to the weeding, or something. That's constructive, at least. This is not. I haven't looked at the information at the other end of the links provided here...thank you everyone who put them up...but I'll check them out after I get some chores done. Thanks Patrice! You never fail to bring an interesting turn to the day. A cease and desist request letter is just that, a request. Until you get a court order, delivered by a sheriff or officer of the court, go right along your merry way. And first there has to be a hearing (to which you are invited to show why it should NOT be issued). I say, let him spend his money getting those orders. Do not desist just because you get a letter written up by "some wacky guy" with a grandiose entitlement complex. Demand due process. i like how they think they can trademark an general term used by everyone in the farm/ranch/home community. i live in oklahoma and we have what is known as a homestead exemption on our taxes. homestead or homesteading was and still is a generic term used today by many people. even though those 2 words are used to describe a lifestyle and not anything specific in regards to said lifestyle the dervaes' think because they are progressive liberals (from california) no less that they can trademark a generic term realted to a particular lifestyle and make money off of said trademark. i agree with patrice and would also like to add that anyone who has written a book,article,story...etc before the dervaes' tried to trademark the urban homesead(ing) term should sue them for copyright infringment especially since the term urban homestead/urban homesteading has been used in books since before they were probably born. 1. Some other websites were using posts or written materials - I assume them to be original materials - on their website without either credit or permission. I can understand that complaint. 2. Dervaes also has trademarked (which, doing a quick search at http://www.uspto.gov/faq/trademarks.jsp#_Toc275426680 shows that it does not have to be registered at the Trade Office to be enforced) other phrases, which is also included under this letter. 3. Her letter states that either the work or phrases should be properly cited and have the trademark symbol, or generic phrases should be substituted in lieu of. 4. If not, there is an indirect threat that she will get her legal council involved. So, it doesn't seem like a C&D letter, but it's close. Since I call it suburban homesteading on my own blog, I guess I'm "safe" for now. Sigh. For some reason the whole thing smacks of a Monsanto-like ploy to me (big guy going after the little guy who's merrily living his life), except I can't quite articulate it all. Trademarking the phrase "Urban Homestead" reminds me of Monsanto trying to get a patent on pigs. Funny since the dictionary says its origin was 1970-75. Books have this name Urban Homestead in their titles even before these people were old enough to wipe their booties, and now they have the nerve to register a trademark on a word that has been around for many many years. Funny, well I guess If they can do it we can do it for any word in the dictionary, how about trademarking the word drink, or city...any how you know what I am saying. CRAZY CRAZY PEOPLE< THEY NEED MORE SEEDS AND SUCH IF THEY HAVE TIME TO WORRY ABOUT THIS STUFF! To make a long story short, for their mean spirit, The McDonald banished them. As I understand it, for some time at least, they were not allowed to use the name in Scotland, and they couldn't do business at all in that county. I HATE California. I HATE everything about California. Californians are the worst of the worst. They are the spawn of the devil. They are the.... Uh oh, wrong topic. Nevermind. Have you filed a trademark application for "Rural Revolution"? You might want to consider it, before they also confiscate that term. I think the point is that a trademark is typically only enforceable if you are using it or something so close that it could be confused with the original in a manner that could do harm to the interests of the original. I can use pioneer woman and urban homestead all I want. These are common English phrases. But if they sell Pioneer Woman Hand-Rolled Poison Ivy Tampons, I'd probably run into trouble if I started selling Pioneer Woman Calamine Lotion Suppositories. Oh my goodness, I'm so glad I got to Jeff's post ... hilarious!!! I don't think you will have any trouble. I just filed the paperwork to trademark the term "cease and desist"! "(REGISTRANT) Dervaes Institute CORPORATION CALIFORNIA 631 Cypress Avenue Pasadena CALIFORNIA 91103"